We have everything ready and running! 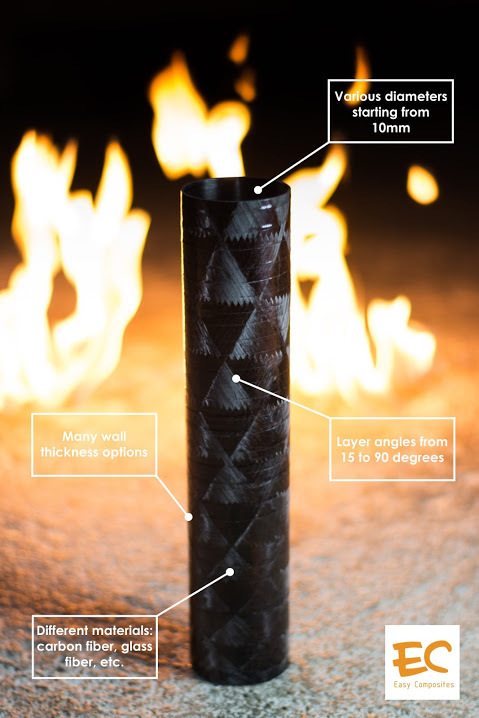 Making composite tubes from carbon and glass fibers, kevlar and other materials. The technology is based on winding process where a rotating core is wrapped with multiple layers of fiber wetted with epoxy resin. Tubes made in such a way have multiple advantages against pultruded or vacuumed tubes – reduced weight and increased strength due to fiber orientation according to intended loading. Various loading modes are possible. For torque loads multiple layers of 45 degree fiber orientation are applied. If the tube is intended to carry bending loads, narrow angles, starting from 15 degrees are required. Each tube is custom made to match it’s loading schedule.